Mother Nature is totally off of her meds here in Colorado this week! The forecasters are calling for a high of 92 degrees today! What?? Oh yes! So hard to believe that Fall officially begins in just a few days isn't it? 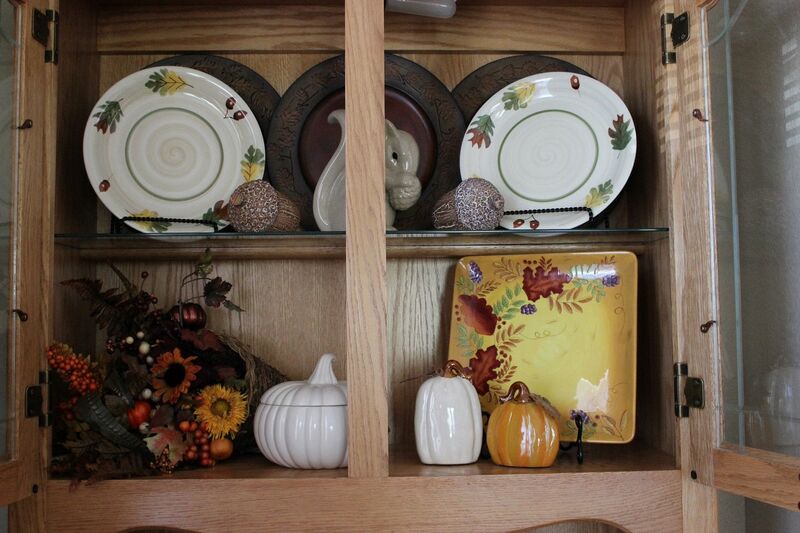 What isn't hard is, decorating the china cabinet for the Fall season! I hadn't decorated the china cabinet in the dining room since Spring! It was seriously time for a change! Starting up top, I kept with my Keep It Simple mantra and just added my favorite wine box and a leaf platter I got at JCP years ago on clearance. 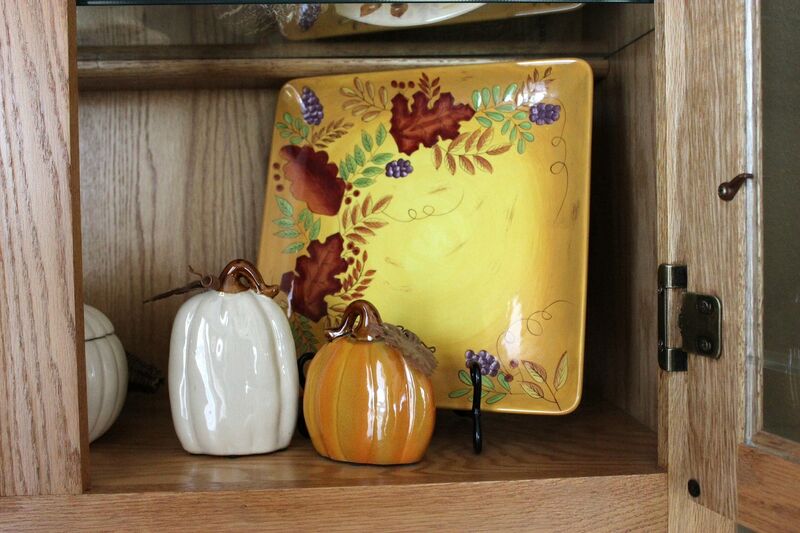 On the upper shelf I layered 3 of the wooden autumn chargers every tablescaper bought at Walmart a few years ago lol. In front I added Fall dinner plates, also from Walmart. I've had the big wooden acorns from Hobby Lobby, again, for years...sensing a theme? 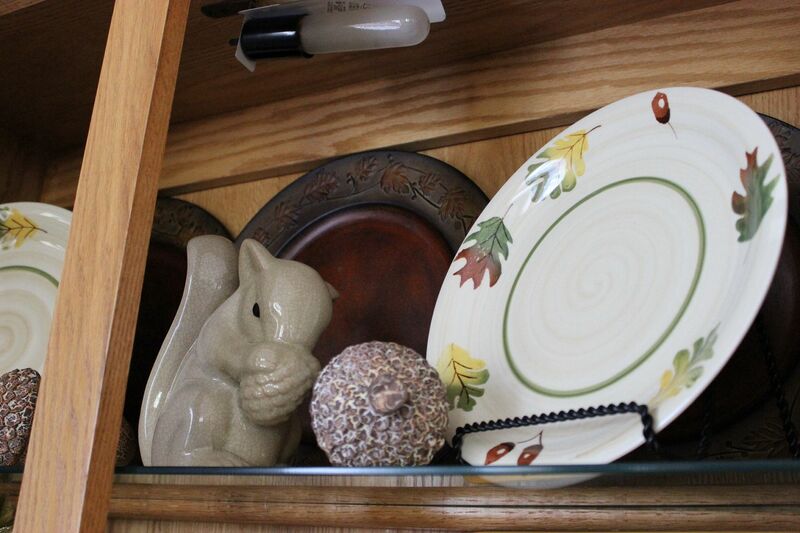 This ceramic squirrel is one of my favorite decor items. He was rescued from Goodwill. On the lower shelf I have a thrift store cornucopia filled with Fall colors and a white lidded pumpkin, also a thrift find. A leafy platter from Hobby Lobby and 2 of the 3 pumpkins of the set I bought at Kirkland's a few weeks ago. The 3rd one is part of my mantel decor. On the main section of the cabinet I kept it to a minimum. A frame filled with leaves from the Dollar Tree, a picture from Hobby Lobby, my favorite rooster and an embellished white pumpkin. 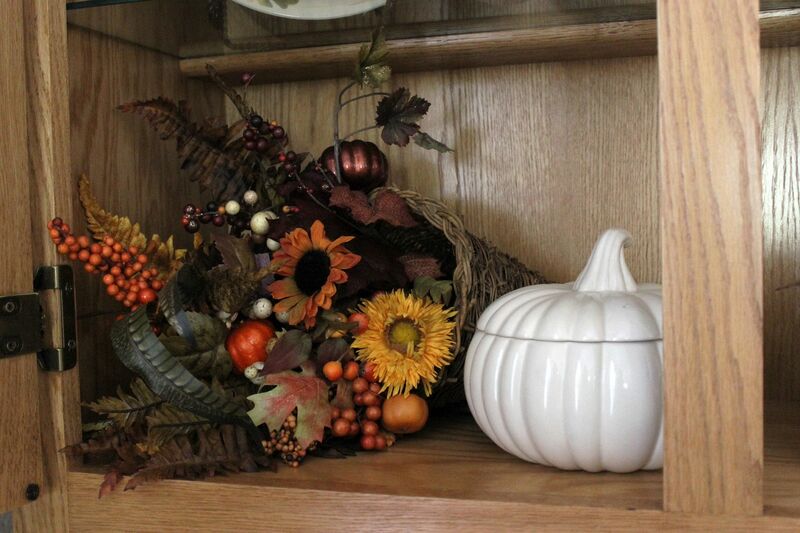 All together, it makes for a pretty and simple fall display in the dining room! As they say to the south of us, Happy Fall Y'all!! 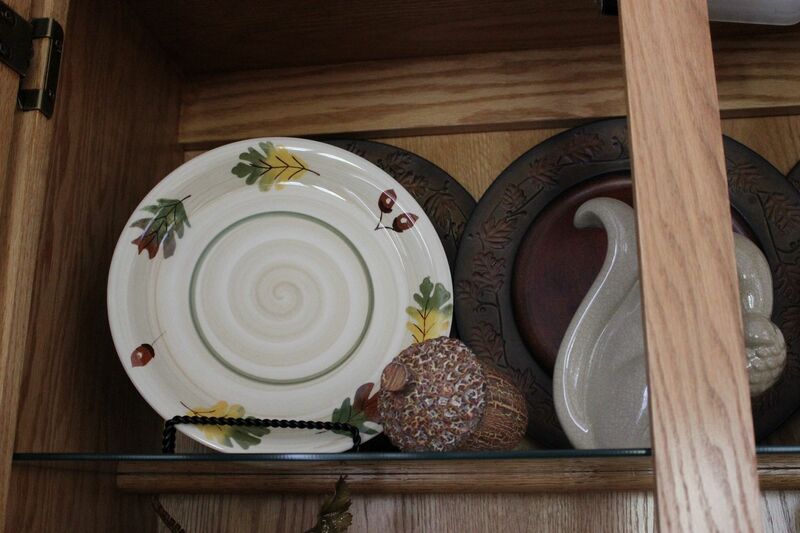 Your autumn hutch is dresssed perfectly for autumn, Kathe! Well done, ma'am - I love all your attention to detail on it. Wonderful choices!! Your Fall decor looks very festive! 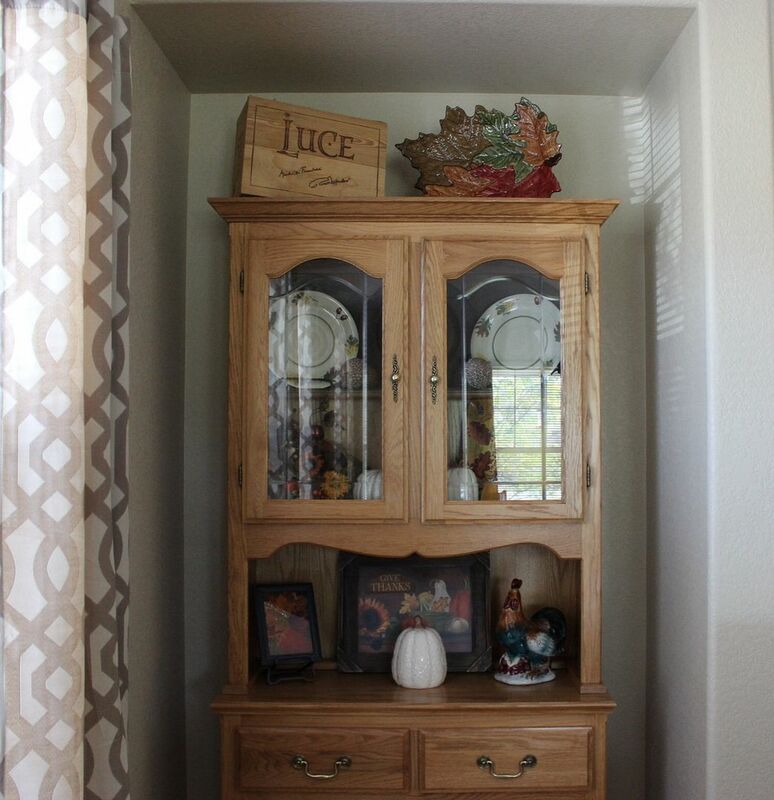 Love your Fall hutch. The squirrel is soooo darn cute! I would have put him in my suitcase to bring home had I seen him when I was there :o) just kidding. If it's sunny tomorrow I think I'll try to get some photos of my decorated shelves. 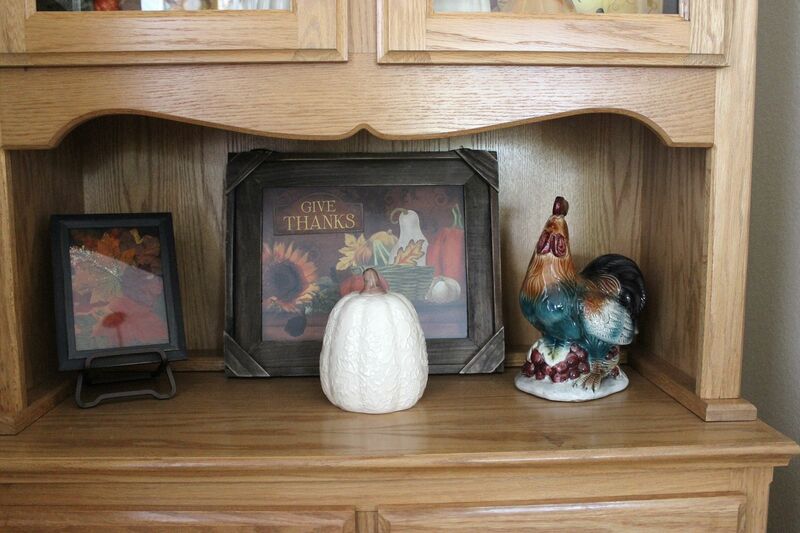 I love your fall hutch decor, so pretty. You always do just enough, but never too much and it looks fabulous. very pretty. I love the squirrel too!! I think once Halloween is over I will set my table with squirrels. Love it! HL still has those acorns and everytime I see them I want about 20....Love those things! and I cannot believe someone gave up that adorable squirrel at the thrift store..but their loss is your gain! Very pretty Kathe. Pretty colored leaves, acorns and a cute squirrel ... the perfect things to usher in Fall. Looks so pretty with your beautiful china cabinet. Just the perfect amount of decorations. You have inspired me to do something about my hutch! I am getting excited to pull out my fall decor! Those acorns are so adorable. Happy and warm fall for you, too! Such a pretty collection, I loved looking at all your pieces. Happy Fall! I love that....Mother Nature is off her meds! Funny! And yes, she's been clearly off her meds here in the Kansas City area, too. We've fluctuated between chilly and downright hot/humid. I don't know whether to pull out an extra blanket or my fan spritzer from day to day! It's nuts!!! But that's fall in Kansas City for you! 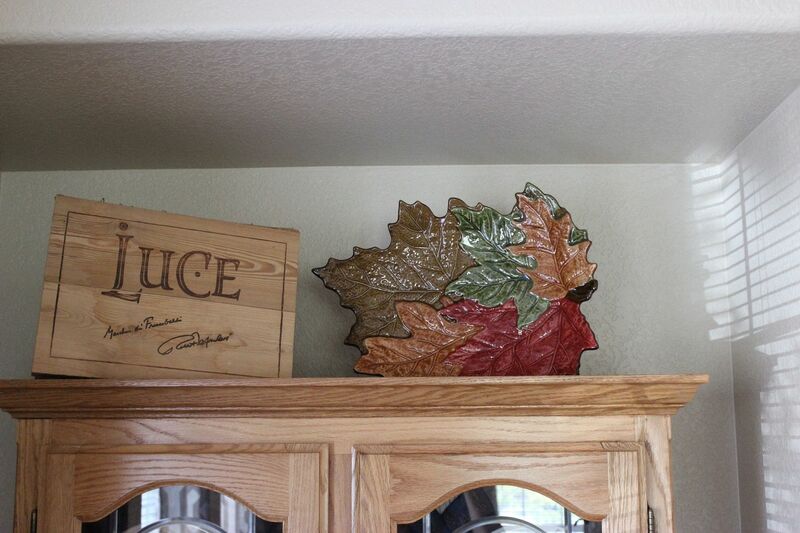 You've added some really nice fall touches to your cabinet! I really like the mix of orange and white pumpkins, dark & light elements. Very nice, Kathe! Nice changes for the season, You must be glad that you finally did it...enjoy! Love the changes Kathe! How did you know I also bought those chargers a few years ago! LOL... they did offer a great look for a low buck didn't they! That squirrel is a cutie and that big leaf platter is wonderful! I am amazed that you guys are still that warm! Back in the 90's when we traveled through Colorado we passed through Wolf Creek Pass in the mountains. We heard that 2 days later it was closed due to snow and that was in mid August! Sure is a beautiful part of the country! Very pretty! Thanks for joining HSH! Kathe, your China cabinet is decorated very pretty. Nice job!